You have to watch your step standing on the roof of Oakland High School. 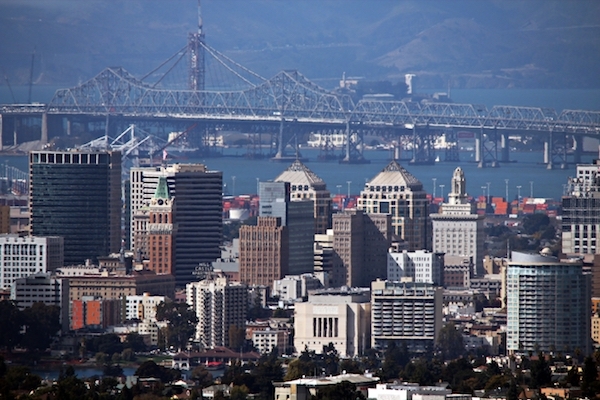 It’s easy to be distracted by the sweeping views of downtown Oakland and San Francisco. There’s wet paint, copper wire, metal rods, power drills and a grid array of small cones protruding from the roof. And this fall, for the first time, a large rectangular object is being fastened to the roof. This is a solar panel. It’s five feet long by approximately three and half feet wide. It is lined with 96 small, dark-blue squares; weighs just over 40 pounds; and sits about three inches above the roof of the school. Rows of these panels now line the roof of Oakland High School. This cluster—as well as those atop 16 other schools in the district—will eventually save the Oakland Unified School District (OUSD) millions per year on its district-wide utility bill once the project is completed in summer 2015. The panels will generate approximately 3.63 megawatts of energy, White said. One megawatt of solar energy can power approximately 216 homes in California, according to the Solar Energy Industries Association, meaning the amount solar panels OUSD is installing could power almost 864 homes. The Oakland High panels, like the rest around the city’s schools, gather energy from the sun and create direct current (DC) energy. The DC energy is fed into an inverter located outdoors at the school. That device changes the DC energy into alternating current (AC) electricity, the kind used to power the school. Soon, not only will the lights be powered by solar energy, but so will the computers, telephones, overhead projectors, printers, fax machines, electric heaters and refrigerators that make the 1,552-student school run. The installations will save the district approximately $1.2 to $1.5 million on its current $7 million per year utility bill, White said. “Every one of these dollars that we’re able to repurpose, due to generating our own energy–those dollars can go back into the classroom,” White said. The solar panels installed at Oakland High School and others will not just provide clean energy to the schools, but will feed back into the power grid, providing more local clean energy for other consumers, Daniel Kammen, professor in the Energy Resources Group at the University of California at Berkeley, said in an email. McClymonds High School, Montera Middle School and Sankofa Academy, to name a few, have had solar panels installed on the roof, while others, such as Oakland Technical High School and Skyline High School, have installed solar panels on top of parking structures in addition to roof top arrays. The schools that have had or are having solar panels installed were chosen based on their structural readiness to receive solar panels, White said, as well as calculations about which locations would save the district the most money on its utility bill. But 17 schools out of 86 are not enough, White said, noting that there is an opportunity to make the district more sustainable. As costs for services continue to escalate in the face of state cuts for public education, school districts need to be smarter “so our kids aren’t suffering from those cuts,” he said. While the generated energy will feed into the grid and will be monitored by PG&E, the energy actually belongs to OUSD, since it owns and operates the system independently, White said. Any energy produced by the solar panels is energy OUSD will not have to buy from PG&E. In 2010, after Oakland voters passed Measure J, a $475 million local control bond measure that funded the project, the district decided the best way to deliver solar was to own its own systems, White said, meaning that “every penny” saved will go to the district. This is not a unique way of operating a solar array, but it is different from how other public agencies—such as transit agencies or other school districts–have chosen to fund solar energy ventures. Alternative methods for implementing and delivering solar energy include deals where a public agency rents solar panels from a third party. The agency then receives a small stipend and the third party “sells” the agency a utility bill cheaper than PG&E, White says. El Cerrito High School first chose this method, known as a Power Purchase Agreement (PPA), but realized that it wasn’t a good idea, and decided to buy its own panels the way OUSD did, according to Cesar Monterrosa, acting director of facilities, planning and management for OUSD. But El Cerrito and Oakland are not the only districts in the Bay Area that have moved to powering schools with solar energy. Just east over the Oakland hills, Mount Diablo Unified School District installed what an article in Scientific American said is the “world’s largest solar installation for a school district,” boasting 12.1 megawatts of renewable energy. The project was completed in May 2012. Across the bay, the San Mateo Union High School District celebrated the completion of its solar energy venture in 2011. The district installed enough solar panels at six high schools to generate the same amount of energy for each school–75 to 85 percent–as OUSD, said Elizabeth McManus, the San Mateo schools’ deputy superintendent for the business services. The San Mateo district also chose, like OUSD, to own and operate its own solar array. Powering schools with clean energy is how White said he believes engineers, builders and employees in the facilities department, those who typically take care of students’ physical environment, can contribute to quality education. “Teachers, principals aren’t the only folks who can contribute to educational outcomes,” he said. Bryan Towers (front) and Caman Chan (back) work with other Contra Costa Electric employees to install Oakland High School’s solar array. Thanks for this great video! Oakland High’s Environmental Science Academy teachers are already on it. Last summer 17 ESA students attended a wonderful Solar Science Camp sponsored by SunPower. You can read all about it on OUSD’s ONews!